disappeared - with no explanation), still reporting and dating a dashing doctor. A complete change in format and cast. 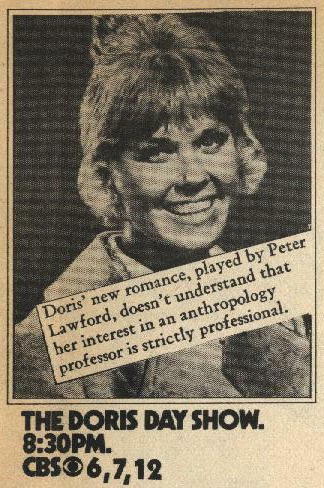 The working and romantic life of a beautiful young bachelorette, Doris Martin, General News Reporter for Today's World Magazine..
opener has Peter Lawford returning as a love interest - and stuck on the sidelines while Doris interviews a handsome bachelor. to feel as she tries to borrow eleven hundred dollars. star she's interviewing is falling in love with her. Cy's hopes to no longer have to pay alimony are dimmed when his ex-wife's boyfriend is tempted by Doris.